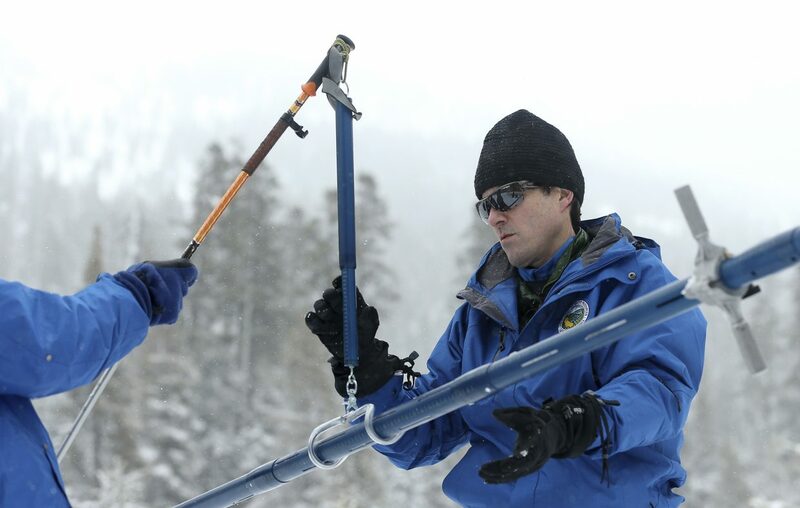 John King, right, of the Department of Water Resources, places the snowpack survey tube on a scale held by DWR climatologist Michael Anderson left, during the third manual snow survey of the season at the Phillips Station near Echo Summit, Calif., Thursday, Feb. 28, 2019. The survey found the snowpack at 113 inches deep with a snow water equivalent of 43.5 inches at this location at this time of year. 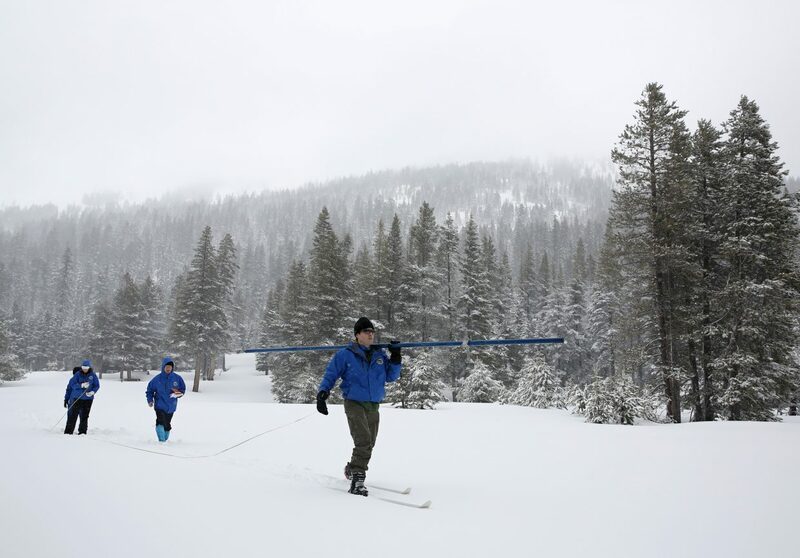 John King, right, of the Department of Water Resources, carries the snowpack measuring tube as he crosses a meadow while conducting the third manual snow survey of the season at the Phillips Station near Echo Summit, Calif., Thursday, Feb. 28, 2019. The survey found the snowpack at 113 inches deep with a snow water equivalent of 43.5 inches at this location at this time of year. 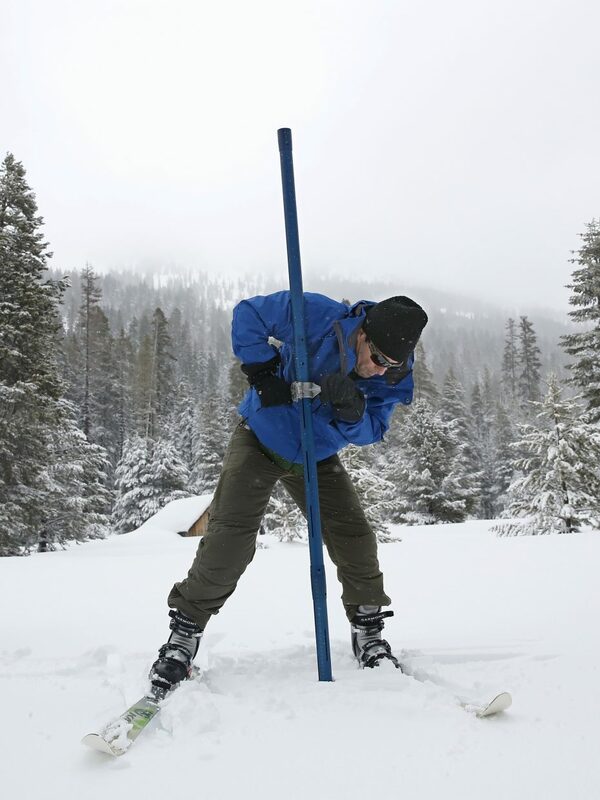 John King of the Department of Water Resources, thrust the snow survey tube into the snowpack while conducting the third manual snow survey of the season at the Phillips Station near Echo Summit, Calif., Thursday, Feb. 28, 2019. The survey found the snowpack at 113 inches deep with a snow water equivalent of 43.5 inches at this location at this time of year. The California Department of Water Resources reported Thursday that Sierra snowpack is now 153 percent of average to date. 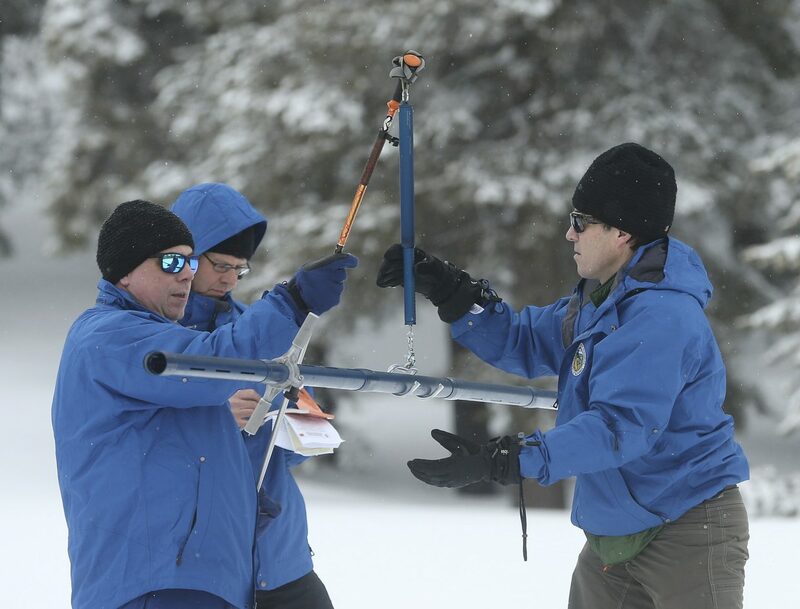 A manual measurement at Phillips Station off U.S. 50 near Sierra-at-Tahoe found a snow depth of 113 inches (287 centimeters) and a snow water equivalent of 43.5 inches (110.5 centimeters), more than double what was recorded there in January. Blizzards have pounded the Sierra Nevada, burying the towering mountain range in massive amounts of snow. On the eastern side of the range, for example, the Mammoth Mountain resort reported nearly 47.8 feet (14.5 meters) of snow at the summit so far this season. More snow is expected Saturday in the Sierra. Phillips Station is where then-Gov. Jerry Brown attended a snowpack survey in April 2015 that found a field barren of any measureable snow. Brown later ordered Californians to use less water. Nearly 21 inches (53.3 centimeters) of rain fell in 48 hours this week near the Northern California wine country city of Guerneville, where the Russian River was slowly receding Thursday after extensive flooding. Downtown Los Angeles has recorded nearly 15.8 inches (40.1 centimeters) of rain this season, nearly 5 inches (12.7 centimeters) above normal to date. A year ago the total was less than 2 inches (5 centimeters). San Francisco has a similar total, nearly double last year’s.